An ICSR report published today details the relative failure of Libya’s Muslim Brotherhood since 2011 (Photo: ICSR). A report on the Libyan Muslim Brotherhood (LMB) concludes that the LMB had relatively little support from the Libyan people post Qaddafi. 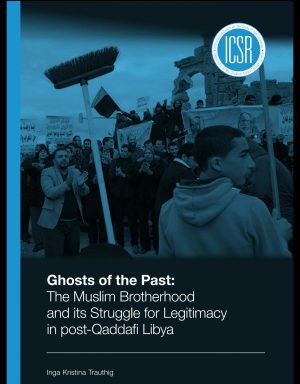 The report “Ghosts of the Past: The Muslim Brotherhood and its Struggle for Legitimacy in post-Qaddafi Libya” authored by Inga Kristina Trauthig and published by Kings College’s International Centre for the Study of Radiclisation (ICSR), was published today. By tracing and explaining the history of the LMB’s most salient organisational developments, the report examines the ways in which the LMB tried to establish itself as a legitimate political actor with regard to its Islamic credentials in the Libyan political sphere post 2011. The report does not attempt to foresee the future of the LMB or its offshoot the Justice and Construction Party (JCP), but draws conclusions based on existing opinions of the LMB in the country, the burdens from the past still influencing the LMB, and recent political schemes that have shaped its image. The report says that after decades operating underground, the LMB tried to establish itself as a legitimate political actor in Libya after 2011 and arrived on the Libyan political stage through the 2012 parliamentary elections. It points out that due to the intolerance of the Qaddafi regime, the LMB had marginal experience interacting with the local masses compared to its counterparts elsewhere. The report concludes that movement seems to have failed to achieve its objective of taking power in the country. It says that many observers as well as MB members themselves were disappointed by the election results in 2012 and 2014, which revealed the LMB had relatively little support from the Libyan people. It points out that the fact that Libya is a majority Sunni country with a conservative society did not translate, somewhat paradoxically, into a conservative Sunni movement, such as the MB, faring as well as many had anticipated, derailing the impression that the whole region was “going Islamist” after 2011. The report says that the LMB today is still haunted by ghosts of the past, such as the decade-long demonisation of the Qaddafi regime, its exiled organisational structure and, connected to that, its impotence in developing a strong social base in Libya. The LMB, the report adds, was quick to blame these factors – exacerbated by their opponents’ fearmongering of a purported Islamist takeover – as responsible for the Justice and Construction Party’s (JCP) poor showing in the 2012 election. However, it concludes that these reasons glossed over the LMB’s self-inflicted wounds, such as the Islamists’ inability to unite or to convince major parts of the Libyan population of their political programme. Nevertheless, the report says that despite the aforementioned points, the LMB in 2018 established itself as a solid political force that has to be reckoned with in the future. This, it concludes, is mainly due to its shrewd manoeuvring and pragmatic choice of alliances. It stresses that despite the LMB’s lacklustre electoral performance, which supposedly vindicates the proponents of post-Islamism, it is premature to equate the Brotherhood’s electoral setbacks with the end of political Islam in Libya. However, political Islam needs to redefine itself conceptually to stay relevant and that the LMB must adapt to a political environment that has been sliding, gradually but steadily, into a battleground for militias in which political institutions constitute simply another means for certain stakeholders to enrich themselves. The report is critical of the LMB zero-sum approach to politics rather than bridging divides and pursuing compromises. But it concedes that like other political forces in Libya the LMB is hostage to military developments in the country, having to operate in a colossally demanding environment: a country painfully fragmented with political forces incapable of controlling the battleground. As a result, the LMB is one of many political forces that was reduced to negligible importance and to struggling with the other political forces for relevance and recognition. Overall, the LMB exhibited a more hawkish and less compromise oriented policy approach than its Tunisian counterpart and, while aiming to grow in importance in the Libyan political sphere, cooperated with some of the more radical Islamist groups. Recently, however, The report says that it moderated some of its stances by, for example, verbally backing the Libyan Political Agreement (LPA). From a social perspective, it remains to be seen if the LMB will succeed in building up a social network resembling what it created in Egypt over the last decades; in the long-term this could strengthen its presence in the country and help it to mobilise and excel politically. The report notes that Libya is no exception in a region of authoritarian systems that drastically weakened political culture and nurtured a zero-sum approach to politics. Therefore, the LMB must also be seen as an outgrowth of Libya’s conditions before 2011; the political forces to its left and right would probably be judged similarly harshly in a comparison along the same lines. This does not necessarily suggest the failings of political Islam as much as the tragedy of a region unable to translate its own revolutions into a better, more confident future, leading to the spreading public conviction that Libya would be better off without political parties. Coincidently, the report comes out just days after the Islamist head of Libya’s High State Council (HSC), Khaled Mishri, announced he was leaving the LMB.